I don’t know how many bridges there are in the world. Thousands, is probably a pretty safe statement. Most of my own bridge photography has been in the states. I have had some very limited opportunities traveling outside the U.S. – most notably in Venice, Italy. In many of these cases, bridges were only an element of the overall image. Bridges come in all sizes, shapes, designs and uses, from foot traffic, to vehicular traffic (trains and motor vehicles, and historically – animal-drawn vehicles. There are some very modern and spectacular designs, and some more “pedestrian” (no pun intended) designs. They range from 100’s of years old, to spans recently built. One bridge design that always appeals to the outdoor and nature photographer is the Covered Bridge. The design of these bridges, probably brought over from Europe when settlers first came to the Northeastern U.S., was intended to increase the life of the bridges. This was particularly true in times when the primary building materials for structures, including bridges, was wood. It was soon learned that bridges that were not covered had a relatively short life span, with weather being the primary culprit. Covered bridges lasted longer, and had the added advantage in cold weather climates, of shielding the bridge surface from snow accumulations. 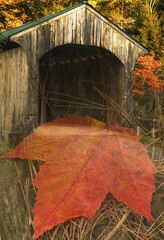 Nearly all of my covered bridge images were made in New England. New England – and especially Vermont – is known for its many picturesque covered bridges. Indeed, I believed Vermont probably had the largest number of covered bridges in the U.S. by a wide margin. On a per square mile basis, and probably on a per capita basis, that is absolutely true. Vermont has around 110 true, traditional covered bridges – most of them well maintained, and many of them very photogenic (particularly in the fall season). For readers who have visited here for a long time and perhaps have been to my LightCentric Photography Website, there is an “Easter Egg” of sorts, here in one of the images :-). My assumption (and remember the old saying about those of us who ASSUME) was that the largest major concentration of covered bridges would be the New England States and most particularly, Vermont and New Hampshire. And they do have a lot of bridges between them. Vermont has around 110. New Hampshire has around 54. Maine and Massachusetts, to my surprise, only have around a dozen combined. To my great surprise, I found – with a little research – that the highest number of bridges in any state appears to be in Ohio! Ohio boasts at least 125 covered bridges. And the largest concentration of covered bridges? Right here in my own “backyard.” Ohio has 125. Indiana has 98. Wisconsin has 35-45 (I am being ambiguous here, because the data isn’t as clear and it appears that many of them are not true road-based, working bridges). Illinois has many, but I wasn’t able to find an accurate count. My “front yard,” by the way (Michigan) has but 8. I have photographed only one of them, the Holtz Bridge in Frankenmuth, Michigan. West of the Mississippi, with the notable exception of the state of Colorado, covered bridges are not remarkable. Most states have an average of 3 – 6 of them. There is a lot of information to be learned about covered bridges on the internet. I am not going to get into what is authentic and what isn’t. Although great for architectural and historical purposes, I am interested in their photogenics only. I did note, for example, that many of the bridges in other states (especially states where you would expect there to be covered bridges) are not “working” bridges, or are ornate foot bridges, parts of resorts, golf courses, etc. But if it has photographic possibilities, I am willing to attempt to shoot it. With literally hundreds of covered bridges just in the U.S., I have my work cut out for me 🙂 . Beautiful images Andy. I’ve never seen your shot of the Holtz Bridge in Frankenmuth before. It reminds me so much of the covered bridge in Warren VT. (Or is it the one on Waitsfield now that I think of it?) Anyways, a beautiful night shot and the snow adds a lot to this one.